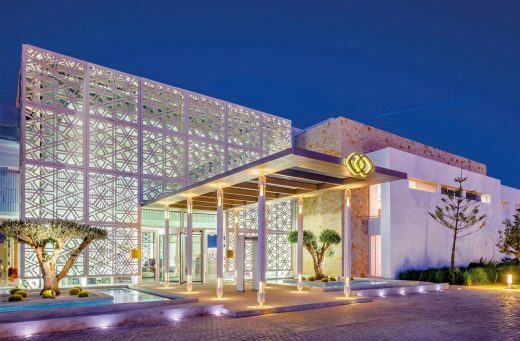 The award of ‘Luxury Beach Resort’ in Northern Morocco and the World Luxury Hotel Awards 2016 went to Galal Mahmoud Architects for their work on this project. In addition, at the same ceremony in 2016 Sofitel Tamuda Bay won the ‘Great Prize’ of the year! 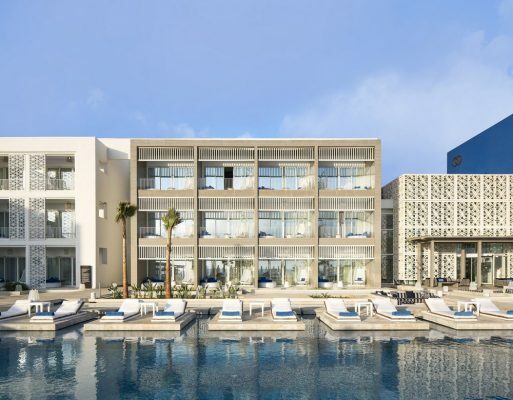 A new ambassador of French elegance in the bay of Tamuda, the Sofitel Tamuda Bay is a 5 star hotel that unites sophisticated Moroccan culture with modern architecture. The hotel has one of the most idyllic views in the kingdom thanks to its location on one of the most beautiful beaches in Morocco with the landscape of the inland region featuring the Rif mountains on the horizon. 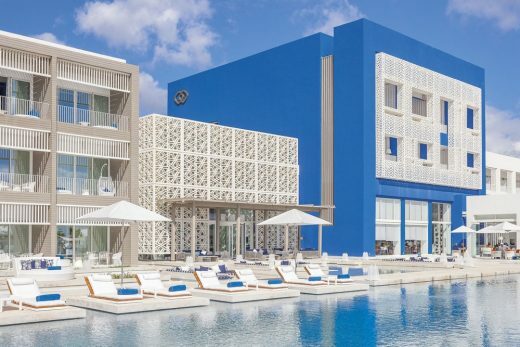 The hotel’s design mingles a contemporary spirit with Mediterranean influences and Moroccan tradition. 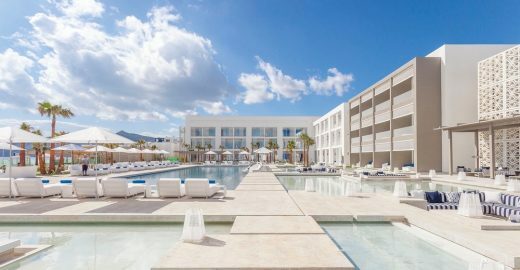 The Sofitel Tamuda Bay is a luxury five star hotel which will open in June 2016 in M’diq, a town located on the northern coast of Morocco about 20 miles east of Tangier. 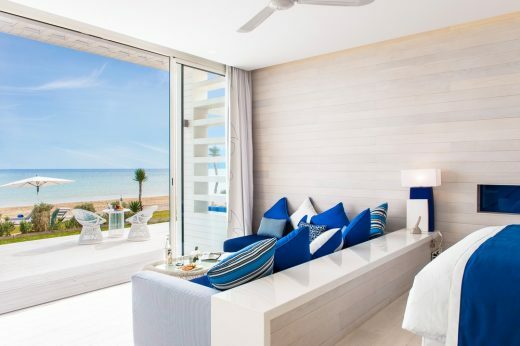 For Sofitel, the Sofitel Tamuda Bay is the luxury hotel brand’s latest project and will be offering 104 bedrooms and suites, eight bungalows and five villas spanning a total floor surface area of 38,128 square metres. 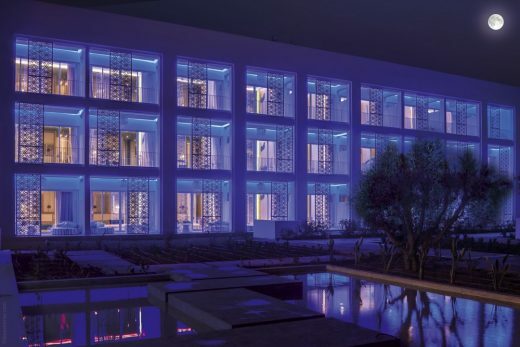 Located on one of the most beautiful Moroccan beaches of the Mediterranean, and set against the stunning backdrop of the Rif Mountains, the Sofitel Tamuda Bay will stand proudly in one of the most idyllic settings in the entire kingdom. Today’s clientele in the luxury hotel sector searches for aesthetics, quality and excellence. 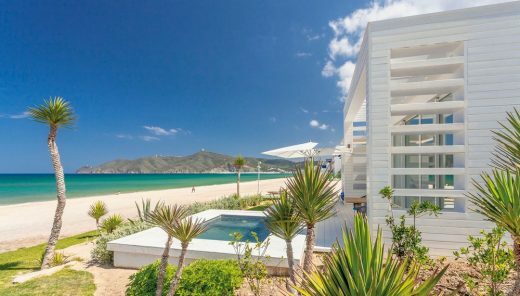 The Sofitel Tamuda Bay, as with most hotels within the Sofitel group, strives to anticipate and exceed such expectations. 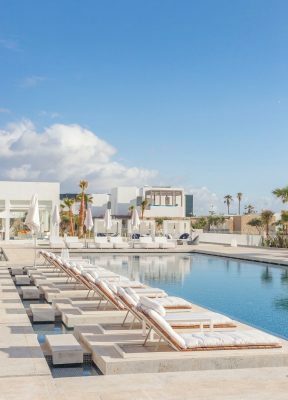 Tamuda Bay offers a genuine experience in French art de vivre combined with the refinement of an authentic Moroccan style. GM Architects, under the leadership of Galal Mahmoud, were commissioned as architects and interior designers for the resort. 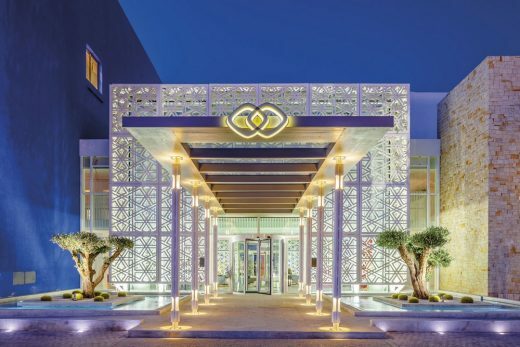 The prize for “Best New Hotel” at the 2011 International Hotel Awards went to GM Architects for their work on this project. The Morroccan office of architecture, Cabinet Ziyat, participated in the realization of this project with unique mission the building permit as well as the follow-up of the works of architecture according to the concept realized by GM Architects. Galal Mahmoud visits each site in person to get a feel for the place, an approach he calls “contextual immersion”. He makes a preliminary study of the site and the surrounding landscape, including local history, in order to integrate contextual references such as climate, geography and even topography. It ensures a certain respect for the identity and culture of the place. 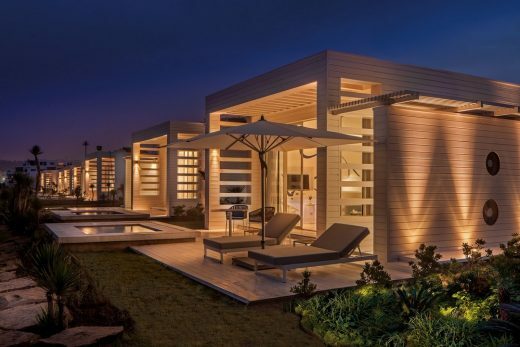 This approach drove the architect’s work for the Sofitel Tamuda Bay. He took the cultural references of northern Morocco and reinterpreted them in a contemporary language, and then integrated them into the final design. Tangier is punctuated with wonderful contrasting strokes of cobalt blue and white and these have been a vital source of inspiration. 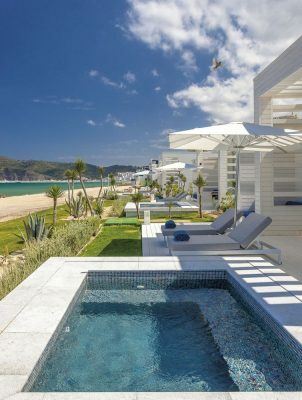 GM Architects designed the Sofitel Tamuda Bay’s architecture and interiors in such a way as to blur the boundaries of indoors and outdoors, with a view to creating a genuine experience of well-being for all guests to enjoy. Sky and sea blend into a beautiful palette of blues to offer a once-in-a-lifetime Mediterranean experience. 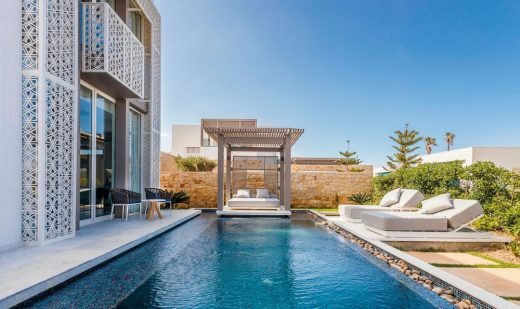 The very essence of the project is the fusion of the opposing shores of the Mediterranean: on one side the French Riviera’s world of contemporary art and glamour and on the other, Morocco’s charming traditional crafts and authentic lifestyle. Resolutely contemporary in his approach, Galal Mahmoud drew inspiration from twentieth century artists whose paintings were highly influenced by their stays in Morocco. 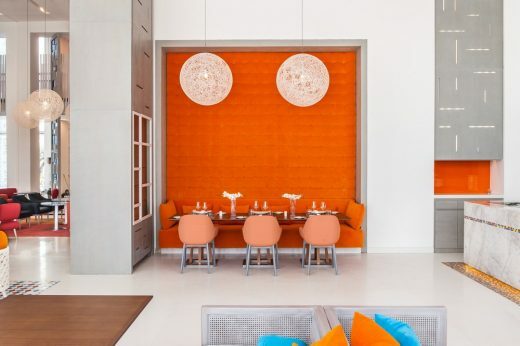 The hotel’s internal spaces pay tribute to the influence of these artists in the choice of pigments, the rounded shapes reminiscent of Moroccan crafted objects, and even the blue birds of the Mediterranean Sea. In the hotel’s various spaces vivid colours contrast sharply with the bright white used in the marble chosen by GM Architects’ team. 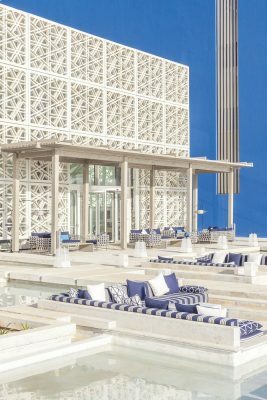 The very essence of the project is based on a subtle mix of modern French art de vivre and traditional Moroccan culture. 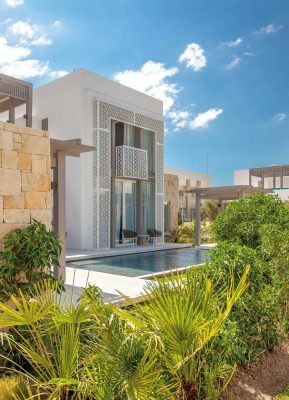 This combination was the overriding principle which guided Gael Mahmoud in the design of each of the Sofitel Tamuda Bay’s internal spaces. 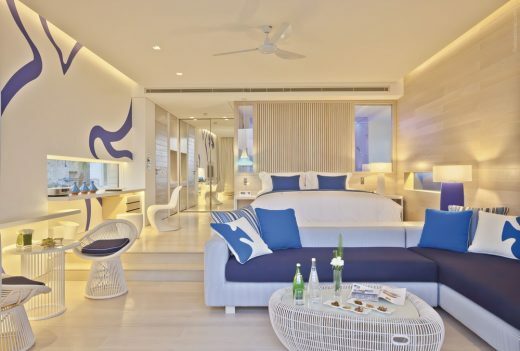 Blending local colours in an enchanting setting, this resort offers a unique atmosphere where guests can enjoy a relaxing stay or head out to the nearby chic and festive marinas. Why have you chosen to work on a hotel project in Morocco? I’m interested in all countries that are steeped in culture and history. I am very familiar with Morocco, I’ve been going there for a number of years. It’s a country which attracts me both on a personal and professional level. 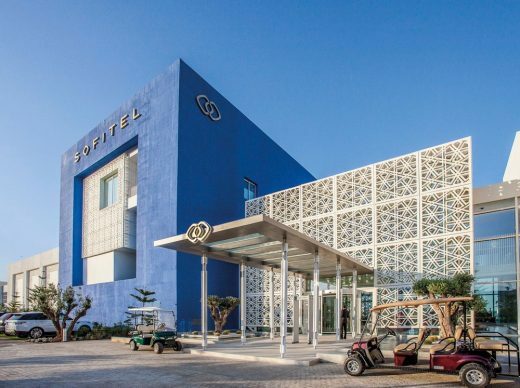 So it was natural for me to say yes to working, in collaboration with Sofitel, on this project for a five star hotel in the coastal town of M’diq in northern Morocco. Did you study the site before starting work? 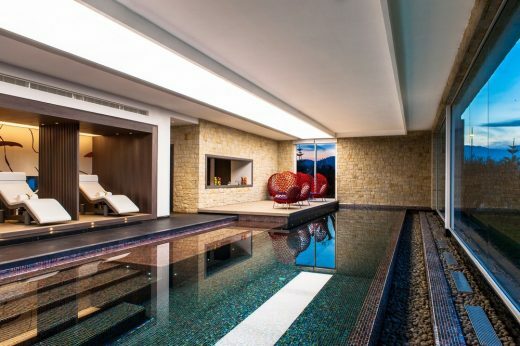 What were your main sources of inspiration for this hotel? Visiting the site in person and immersing myself in the location is at the heart of my philosophy. It is a very important concept for me, an approach that I like to call “contextual immersion”. For each project I make a thorough study of the site and the surrounding landscape, including local culture and history, in order to integrate contextual references such as climate, geography and even topography. It ensures a certain respect for the identity and culture of the place. When it comes to the Sofitel Tamuda Bay, this approach really did drive my work. I took the cultural references of northern Morocco and reinterpreted them in a contemporary language, and then integrated them into the final design. Tangier is punctuated with wonderful contrasting strokes of cobalt blue and white and these have been a vital source of inspiration for this new project. What did your work consist of for the Sofitel Tamuda Bay? What choices did you make for the interior design? 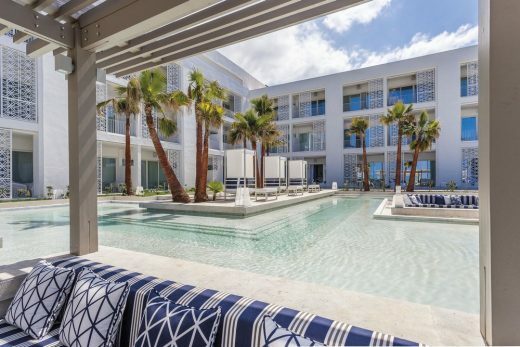 The Sofitel Tamuda Bay’s architecture and interior design were entirely conceived by us at GM Architects in order to allow for a smooth and seamless transition between indoors and outdoors which will help guests experience a genuine sense of well-being. This approach is in perfect harmony with the holistic work carried out by GM Architects whereby architecture and interior design are closely linked within a scenography that blurs the lines between indoors and outdoors. 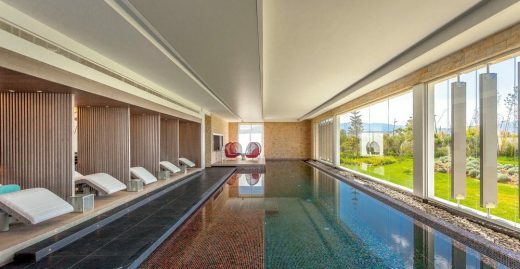 We strive to deliver a unique Mediterranean experience to our guests, a refreshing stay not to be found anywhere else on Earth. Having made the choice of a resolutely contemporary approach, I decided to draw inspiration from twentieth century artists whose paintings were highly influenced by their stays in Morocco, in particular the rounded shapes, pigments, colours and, of course, local objects. 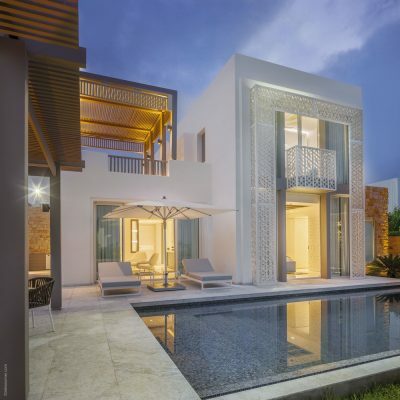 This subtle combination of contemporary French art de vivre and Moroccan culture was the backbone upon which to build each of the interior spaces. 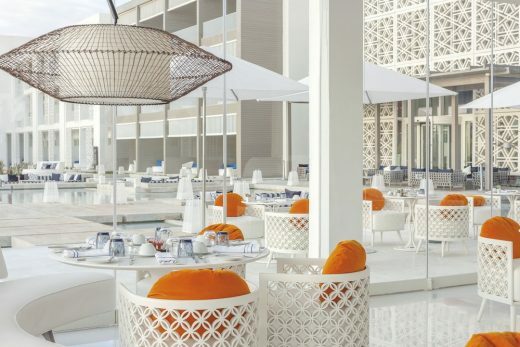 We worked in close collaboration with Sofitel in order to capture and recreate the deep connection that exists between France and Morocco. Our aim is for each guest to embark on a voyage of colour, history and culture. 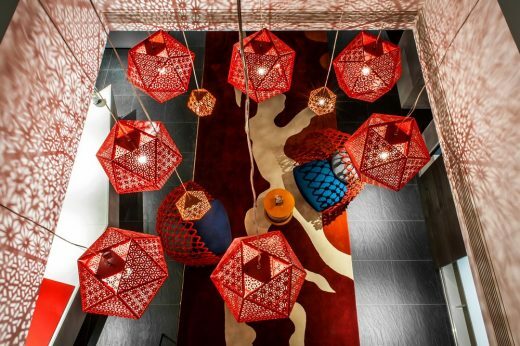 Were you inspired by traditional Moroccan craftsmanship for this hotel? Moroccan culture and craftsmanship are rich in colour and texture and, as far as I’m concerned, are highly characteristic of this Mediterranean civilization which has evolved over many centuries. They are, for me, an endless and permanent source of inspiration for each of my projects. The use of innovative materials and methods allowed me to reinterpret this traditional lifestyle into a contemporary language. 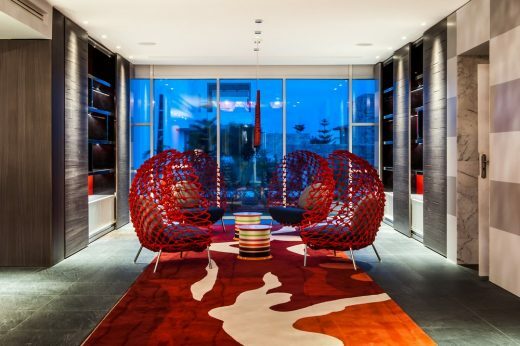 A telling example is the use of Plexiglas to create the moucharaby screens of the Sofitel Tamuda Bay.